Bay Area Lost Horizon Night Market April 30, 2011. 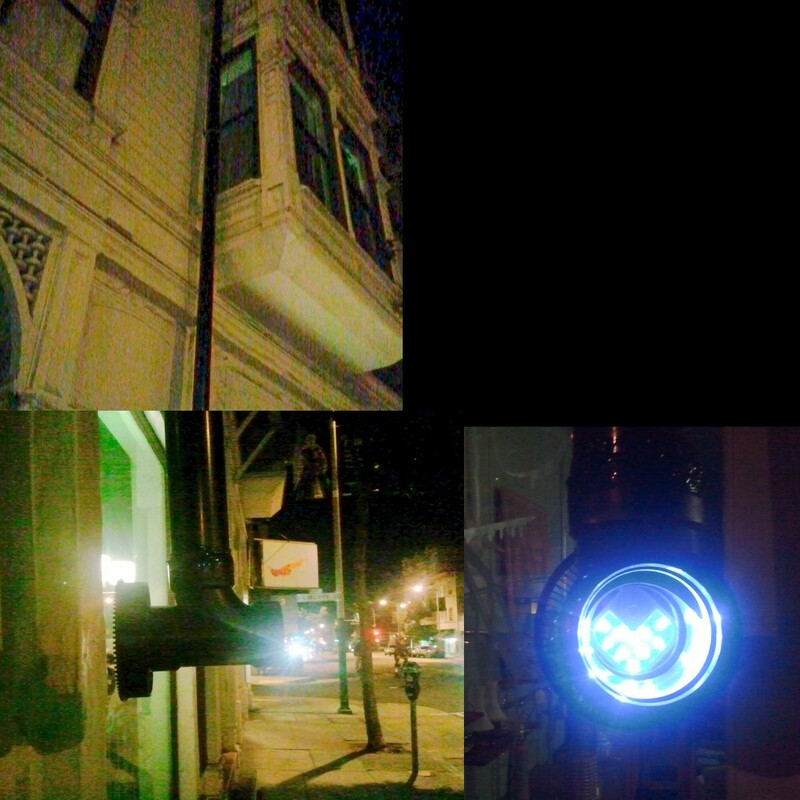 On a deserted street in Oakland. 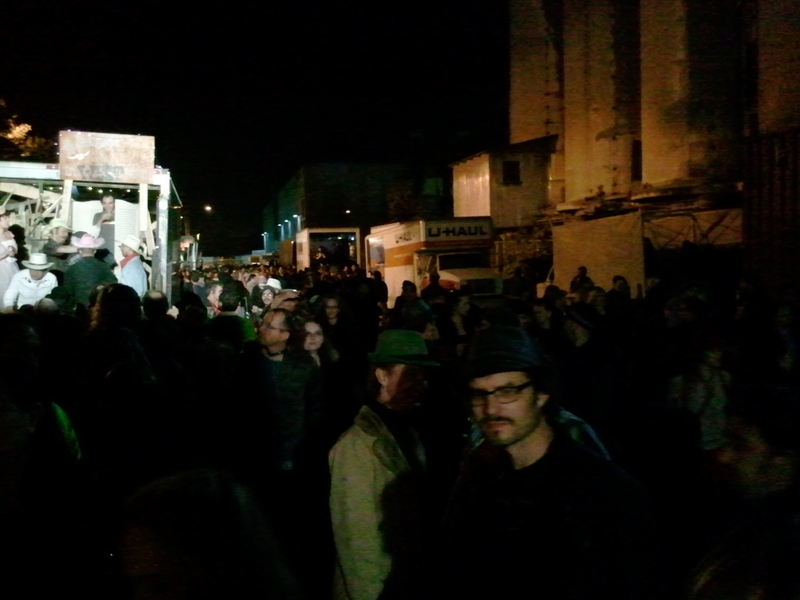 Bay Area Lost Horizon Night Market. This truck had padding on the walls. A person would enter with protective gear and a big hammer. They'd have some time to smash all the objects in the truck as hard as they could. Awesome. 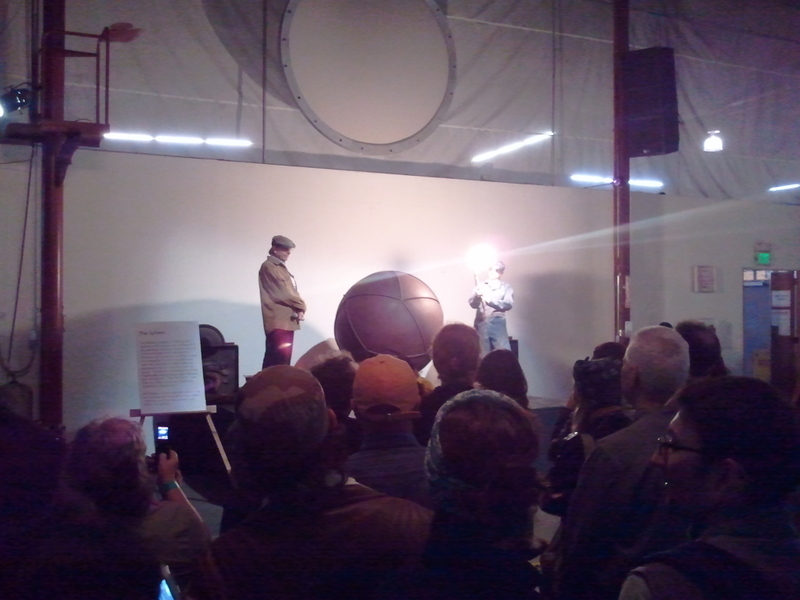 Billy Heibert smashed this amazing ceramic sphere he built in 1983 on stage. There was a moment when the hot hammer was going through the ceramic, and it had shattered into a hundred pieces but it was still roughly in the same shape. I could see bits of the wall behind it in slivers. It looked a lot like a water balloon that had just been popped, a tumultuous ball of water that had just forgotten what shape it was supposed to be. One moment it existed. The next, it didn’t. Wow. And when I say “hot hammer”, I mean it! 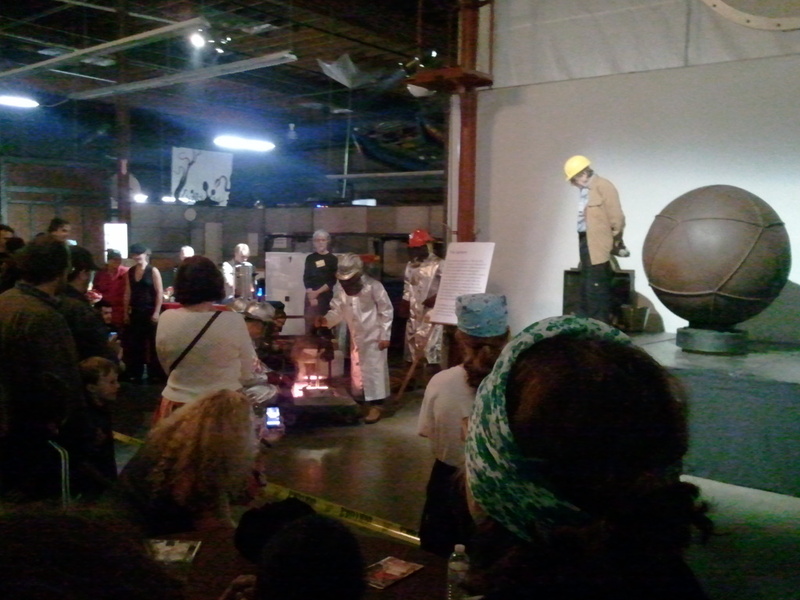 On stage, they poured bronze into a sand mold and made a hammer before our eyes! I was really surprised how fast the metal of the head cooled. They first pulled it after maybe 45 seconds but the bronze was slushy and only some of the hammer was formed. They smooshed it it back in and pulled out a red hot hammer after another 30 seconds. They handed it to Billy and he smashed the sphere! 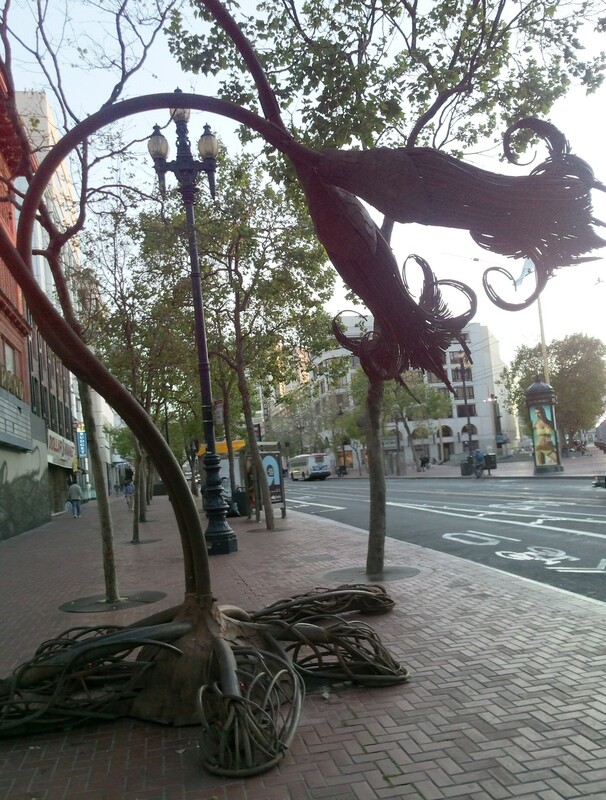 I was walking up Market St last week and came across this giant flower near Civic Center. 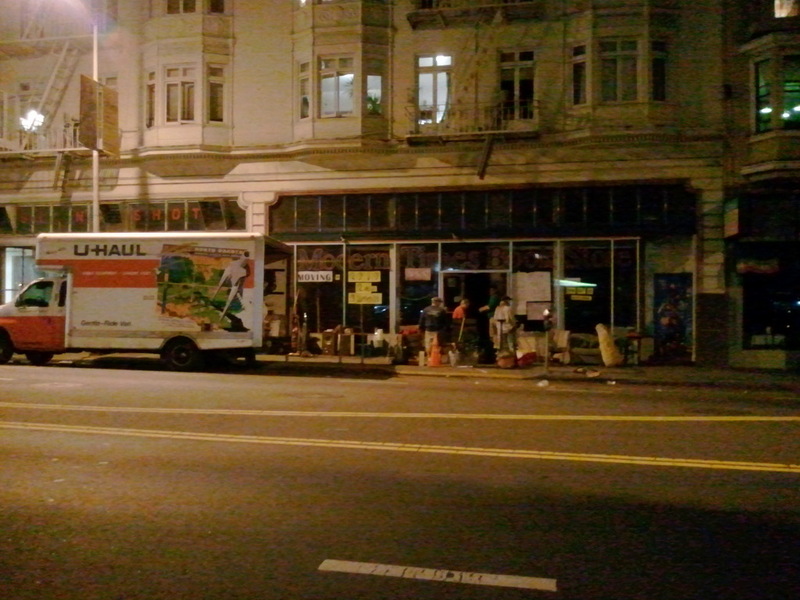 Walking home last Monday night, May 2nd, I watched as the Modern Times Bookstore closed it’s doors for the last time at it’s current location. I overheard phrases like, “I can’t believe this is it.” The vacancy rate of storefronts in my neighborhood always scares me. Modern Times is reopening on 24th St in a month so says their website. Competitive Swinging! 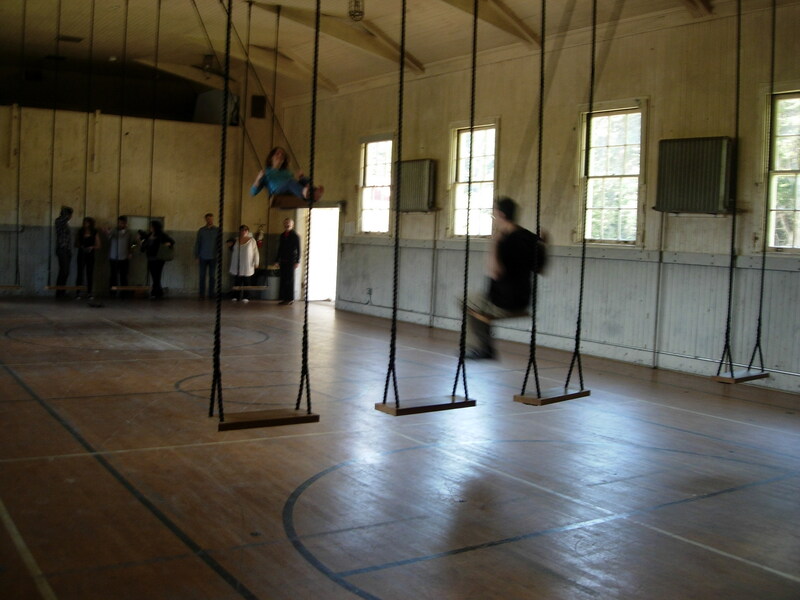 That is Jen and I swinging. On Sunday I went to the Headlands Center for the Arts with a better friend to see Paolo Salvagione’s “Competitive Swinging“. A set of totally grownup swings. It was cool. His girl Jen showed me Paolo’s art catalog from the Headlands Center, he has a bunch of pretty awesome pieces! From a Magic 8 Ball that always says “Yes”, to hopscotch that makes you light as a feather, brush bristle shoes, an eclipse machine, a crazy spinning mirror/window… I’m recalling these from memory because they all stuck with me! Bowling at the Headlands Center for the Arts. Oo, gutter ball! 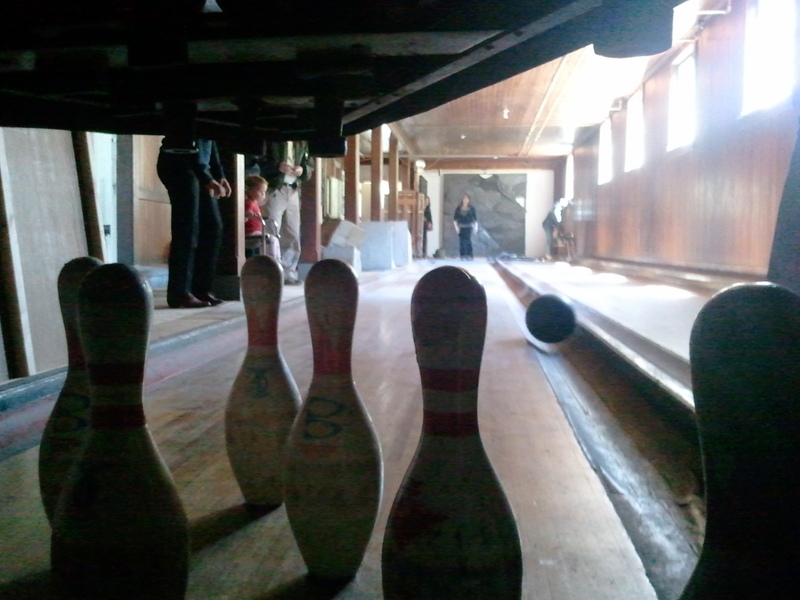 Did you know there is a bowling alley in the basement of the gymnasium of the Headlands Center for the Arts? Rumor has it that it has the oldest mechanically set pin machine west of the Mississippi. I took this photo from the position behind the pins because that’s where you stand as the pin setter. Groovy. 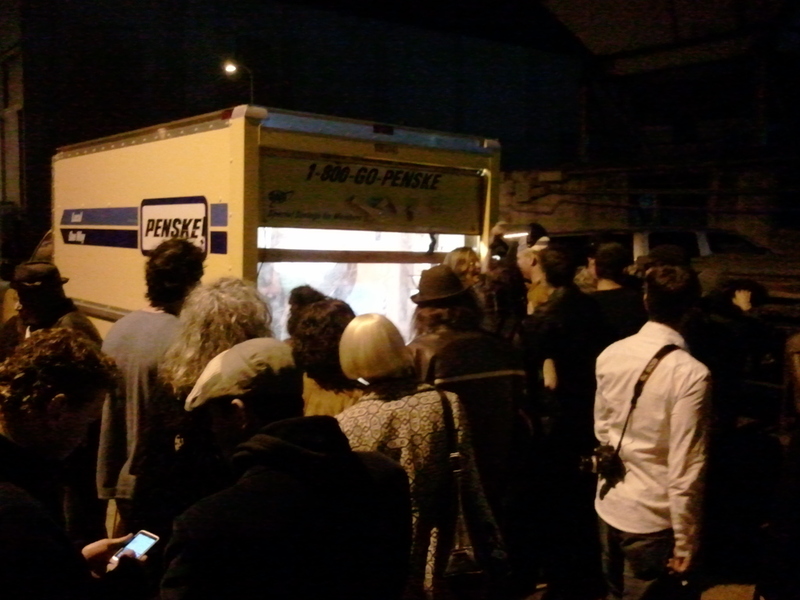 That was the closing show :-( Paolo said he is going to try and set them up in the future at galleries. But at this show they’ll be down in a week or so. Oh, well, next time… I will train in the meantime! !